Next up from Parfums DelRae will be Mythique, a new fragrance for women inspired by Diane de Poitiers, the Duchess of Valentinois and mistress of Henri II of France. DelRae Roth has captured her spirit with Florentine iris and flowers found in the gardens at Chenonceau, the Loire valley castle given to Diane de Poitiers by Henri II (Catherine de Medici kicked her out after Henri II passed away). Other notes include mandarin, bergamot, ivy, peony, jasmine, sandalwood, patchouli and ambrette. I will update with the size and concentration when I can find them. 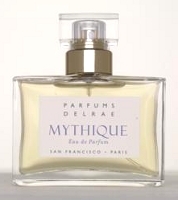 Update: Parfums Delrae Mythique was developed by perfumer Yann Vasnier, and is available in 50 ml Eau de Parfum. Another update: see a review of Delrae Mythique. Other recent launches from Parfums DelRae: Emotionelle. 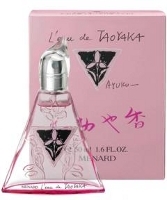 Menard will launch L'Eau de Taoyaka, a new "delicate and harmonious" fruity floral fragrance for women that celebrates the brand's 50th anniversary. The notes feature atemoya blossom, cherry blossom, galbanum, ginger, jasmine, lily of the valley, violet, rose, iris, ambrette, vanilla, musk and cedar. Other recent launches from Menard: Menard For Men. Hey, look, R! They did an iris for you! Must have been trying to make up for that melon thing..
Do you ever find that when you're excited about one perfume, it kind of overflows onto other scents? As in, I'm yearning so hard for that Mythique, I find myself looking at the Menard and thinking warmly 'that sounds LOVELY'. PLeeeeeease let that Mythique be as good as it sounds – I'm dying to be in love with a DelRae again. LOL — but haven't even smelled the melon thing yet! What happened to the big slow down this year? They're coming just as fast as ever! I think it's the Menard packaging. That thing is CUTE. But where is Emotionelle? Has it arrived anywhere in the states? I am anxiously awaiting it, MDCI Riche Oriente and Un Matin d'Orage. So that bottle really is sweet, right? Phew. Do you know when Mythique will be available? I don't know! I want that AG the most, at the moment. And so is the box. Actually, I like the box even better, but that's silly because I throw them away. Oh my goodness…a Delrae featuring iris!!! My wallet is cringing with fear and my nostrils are fluttering in anticipation. I perked up at the sound of iris too, though am still haunted by the sticky, spicy indolefest that is Amoureuse. Fragrantfoodie, it does sound very tempting! And it probably won't be cheap. LOL —oh no! another visual! eager nostrils….I don't know why but that strikes me as so hilarious, I almost spilled coffee all over myself! However, I think my credit cards are fluttering….oh nope, they're shaking with fear….that's different I think.